Crow/Northern Cheyenne artist Ben Pease considers himself an Indigenous creative, using creativity not just for art but also for education and storytelling. Ben Pease, winner of the Curator’s Choice Award at the High Desert Museum’s 2018 Art in the West exhibition for his work “Keeper of the People,” explores the history and the future of Native American heritage through mixed-media art. Born on the Crow Indian Reservation in 1989, Pease grew up in southeastern Montana with roots in both the Crow and Northern Cheyenne nations. 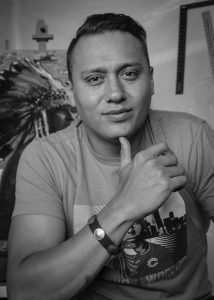 As a young, contemporary Indigenous artist, Pease’s work is well known for its unique and culturally relevant style. Find him online at benpeasevisions.com. When did you know you wanted to be an artist, and what inspired you to take that path? I’ve always been an artistic person. I suppose I get my creativity from my family and our history, quite literally our DNA — we’re not too far removed from a life of creation, creating beautiful things for daily use, for ceremonial use. Growing up on the reservation the art programs were sparse and almost nonexistent. When I was a kid, my mother decided to bring me to the Charlie Russell Art Week in Great Falls, Montana. I came into this place and it was total culture shock because I had never seen such amazingly made jewelry, such amazing Western wear, such big hats! It was this whole other world, and when I walked into the booth of another Crow artist — Kevin Red Star — and saw him painting … I thought, he’s from where I’m from, the same place, and I figured if he could do it, I could do it. That’s where it started. Do you consider yourself a storyteller and an educator as much as you do an artist? It always comes down to am I a Native artist, am I an artist, or am I a creative. And I think the latter because it’s so much more than just being an artist, just an educator or just a storyteller because you have to be creative in all the words you choose, in all the things that you share with other people. Where do your ideas for your paintings come from, where do you find your inspiration? I get my inspiration from my culture, our history, from relationships between different entities whether that’s a tribal entity or a U.S. government entity or even other nations around the world. When I begin a work, I don’t really sketch it out. I just sort of start and things come to me. I begin with the substrate, the canvas, and I use historical paper items — money, signage, antique ledger papers, antique newspapers, vintage comic books — as a cultural reference point, linking to some idea or some thought I’m having, because I’m always thinking and things just move from my head into my work. Ben Pease draws inspiration for his art from his native culture and his family — the Tribal Elders and his wife and their two sons. Do all of your pieces relate to your Native American heritage? Yes they do. 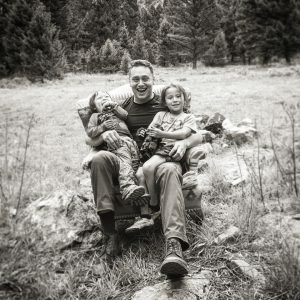 I’m trying to figure out my own place in the world and to figure out where I am going, and not just me, but me as we — as a people, our communities and our tribal nations, and as a family with my beautiful, amazing wife and our two sons. Would you say that there’s a theme that runs through all of your work? I practice with a lot of other Native American artists — we call ourselves Indigenous creatives — and we see many non-native or non-indigenous people doing Native American artwork and making a killing at it, selling pieces for thousands and even millions of dollars. And really, that’s who we are. We’re the ones from the culture. So that’s where I’m coming from, we want to be that true, authentic voice and to come into the Western art world with an accurate perspective. Why do you collage various paper items into your art, and how do you find and choose those items? One word on a piece of newspaper, or a certain year on a thousand-dollar water bond from Montana, something like that will spark my interest. If I have an idea, it’s just in my head. I take my subject matter and my objectivity from my knowledge, from what I’ve learned from my culture and my family. And that’s really where it comes from. It’s not written down anywhere, it’s part of our oral history and part of the histories that the non-natives, the newcomers, have written down for us. A lot these paper items I’ll find at antique stores, or on ebay, and I have collectors who provide me with a lot of items. I do a lot of research, a lot of asking. Many of my family members are elders of the tribes, so I do a lot of finding information that way. I find a lot of my photographic references online in archives from various institutions — museums and universities. I have to do hunting on many sides, and that’s almost half of the job. Are the pieces you collage into your work just symbolic or is there also a visual aspect to their inclusion? For quite some time now I’ve been telling people that I am not in the game just to paint a pretty picture or in the game for aesthetics. I am coming with an open heart and open eye. I know that there is a constructed dichotomy of viewpoints and I want to try to understand both sides, and many other sides. I try to be subtle with my messages. I try not make people too uncomfortable, but I want to ask questions that people aren’t asking. Sometimes I do that and let people know and be very forward, and sometimes it’s on a piece of paper I put on the back of a painting and nobody will ever see it or even know it’s there. Who would you consider your audience and what do you aim to say to them through your art? Everybody. But, I do understand that not everybody knows our history so I am working to provide the history. I think if somebody wants to know more about my artwork they almost have to be in the room with me because it doesn’t always spell out what I want it to. My collectors always tell me that every single day they see something new and catch a new connection in one of my paintings which they didn’t see before. That’s what I want people to work for, I want them to think about what things mean from the past and for the future. My painting is not just for Natives, it’s not just for white people, it’s for everybody. Ben Pease’s piece, “Keeper of the People,” has been awarded the Curator’s Choice Award for the High Desert Museum’s 2018 Art in the West exhibition. Congratulations on your Curator’s Choice Award. What inspired “Keeper of the People,” and what does it represent? It’s part of my Indigenous Madonna series. It features a young Crow woman and really talks about the Crows’ belief of women as being the most holy beings, the most sacred beings, the closest to creation. If you have a strong need or a strong prayer, if you’re really in a hard time, you’re supposed to give your prayer and your thoughts to a woman so she can pray for you. Because she can give life, she is sacred. 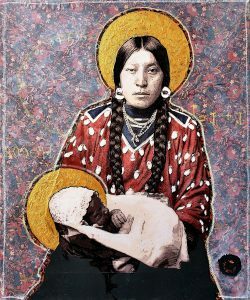 The halo in the painting represents that women are holy, but is also speaking toward cultural appropriation, to ask who sets those boundaries and why and is culture exclusive. The common line that almost any artist will say is that a work is never done. For me, I’ve just recently figured out that every painting I’m working on is neither finished nor good enough. So I think about it like that, when a piece doesn’t seem like it’s up to my standards, I move on to the next one. I decide I need to try something else. Artists get creativity block so changing your mode of acceleration is important when that wall comes. Then all the art shows come up and I realize I need to put these pieces in, so I varnish them and put them in the show. That’s how I finish them.